I love crossing my own finish lines, but I get a HUGE kick out of seeing friends and training partners cross theirs. I was a hugely annoying person at the finish line of IMC; as we sat trying to enjoy a drink, every time someone I knew would cross the line, I’d spring up – shrieking – and then sprint down the chute to go give that person a big sweaty hug. I should note that there is no better hug than a sweaty, finish line hug. Hands down. Anyway. I had the privilege of watching Gary, Danny and Nancy all cross the line this year, and since they shared their prep stories with me before, I thought it would be fun to check in with them post race and see how they are faring. Since Danny seems to be frolicking in Mexico with his family and not using his beach time to answer my questions, let’s start with a catch-up with Gary and Nancy. Since we last talked, how did the final build and taper into IMC go for you? 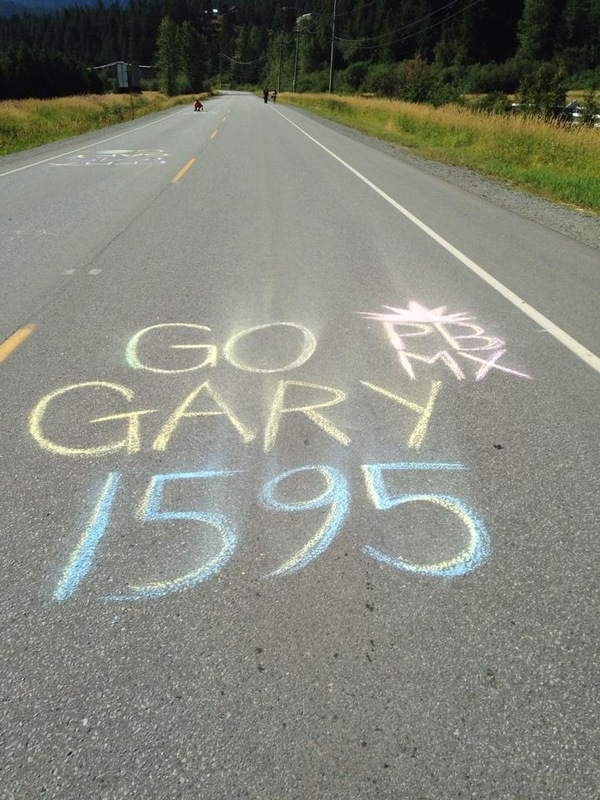 Gary Martin: Training had been going really well throughout the year and I’d managed to stay injury free, that was until July 1st when on a fun Canada Day run in the village I had to pull up 6km into the 8km course with a seriously painful achilles. This unfortunately put an end to my running training until race day and certainly messed with my mind. Thankfully I could still bike and swim without aggravating it so continued to persevere and get as ready as best I could for the big day. Would you have changed anything about your prep? GM: Given the unexpected injury and the way my support team of physio, chiro and massage therapist all rallied to try and fix me then no, there’s nothing I would have changed but I would have obviously preferred a smoother less stressful, injury-free prep. NJ: More early season riding, preferably Maui. I missed having that longer distance base from when the weather is nice enough to get outside here. How does having IMC in your “hometown” feel for you when it rolls in? GM: It felt fantastic and I was so proud to see so many people out here training and to race with hundreds of other dedicated athletes in my own back yard. I remember on race day riding back from Pemby and being able to describe every corner, straight, climb and descent to someone from out of town. I know this course and love this course so well and can’t wait to see another batch of crazy people attempt to conquer it again next year. NJ: IMC in Whistler feels great. For sure I get nervous as it gets closer but when I see the first few trucks with M-dot logo roll into town and I’m excited. I absolutely check out the expo, talk to folks, see what’s new and attend the pre race meeting (great to have multiple times to choose from this year). Did you get nervous seeing all the athletes? GM: No, seeing all the other athletes just got me excited. 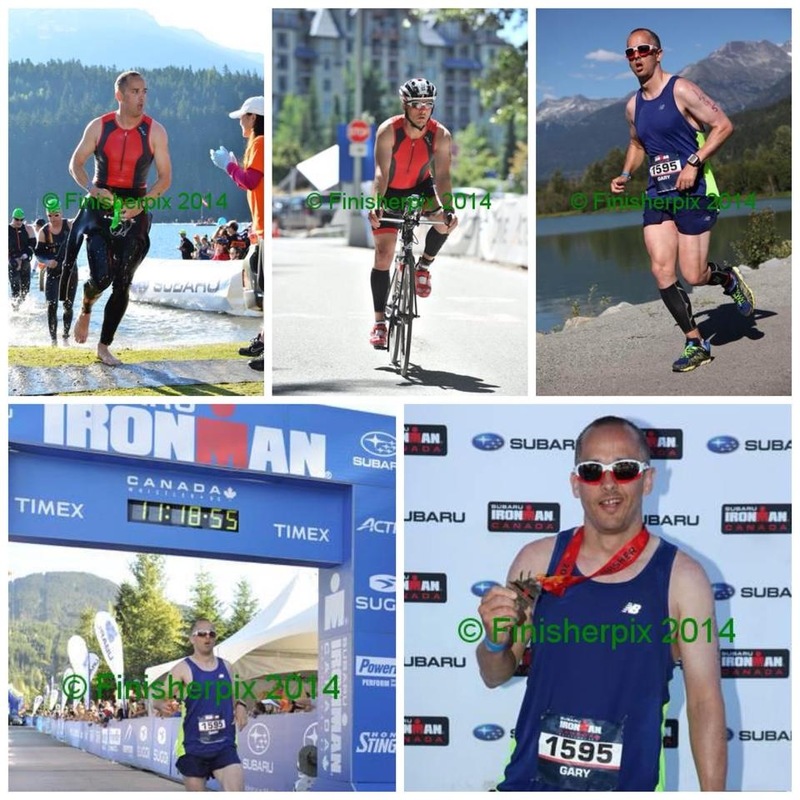 Having competed in three other triathlons this year I felt pretty well prepared for race day although this was certainly a lot bigger than any of the previous events. Did you cruise the Expo and take in all the extra activities or did you hunker down and rest and avoid all the hoopla? GM: I tried not to get too distracted by the Expo although I’d be lying if I said I didn’t take a quick peek at all the awesome goodies on display. I was fortunate enough to be able to take a couple of days off work to try and unwind before hand which really helped and getting to enjoy the opening ceremony was great. Seeing all the other athletes and hearing some of the stories how people have had to overcome large adversities was really inspiring and motivating. Is there a particular moment in the lead up to race day that really sticks with you? GM: If racing wasn’t enough, myself and three friends along with our wives decided to use this opportunity to raise some money for a very worthwhile charity, Canuck Place Children’s Hospice. 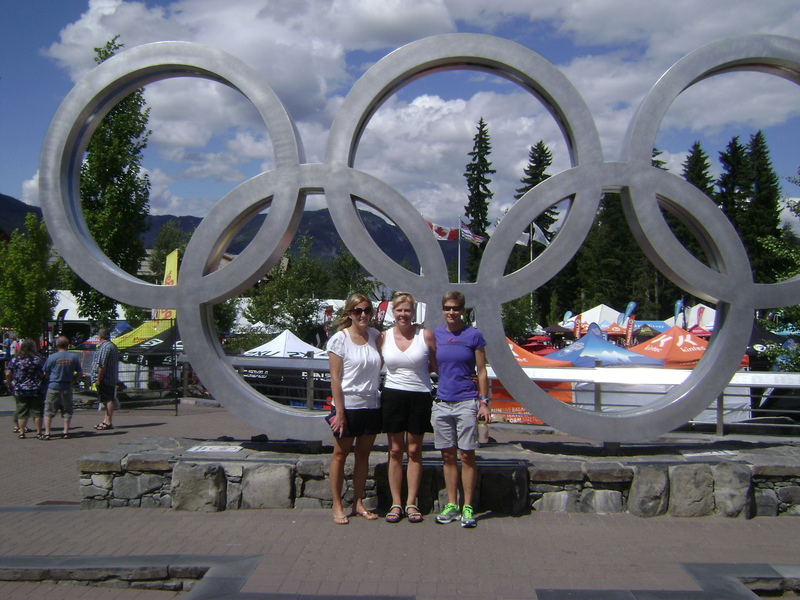 Pan Pacific Whistler connects us all via either profession or marriage so we became the Pan Pacific Whistler Ironmen and set ourselves a lofty target of $10,000. With just a week to go until race day we reached our target finishing with a total of $10,600, a huge moment that definitely sticks with me. NJ: I was freaking out because I was getting sick – thanks to Kim at Nesters for loading me up with all the immune boosting and cold fighting tips. And then I was very relieved to have two of my sisters fly in and help too. Tell me about your race day in terms of swim/bike/run. If you can, break down your race. GM: Swim: The first word that comes to mind when describing this is ugly! Having completed many triathlons in the past I thought I was prepared for what I was going to face, races with a few hundred athletes doesn’t even come close to splashing around with nearly 2,000. Within the first few hundred metres I was kicked in the nuts, punched in the head and kicked in the face, not ideal for sure. Because of this I really struggled to find my rhythm and the pace I had hoped for, as a result I came out of the water just over 5 minutes slower than I had hoped. Bike: From day one after signing up this was the leg I’d been most looking forward to and for the first few hours I was loving it. After the swim however I really struggled to get any food down so by the time I hit the Meadows I also hit a brick wall. After some test races earlier in the year that I’d faced some challenges in, and which I did not deal with very well, this time was different. I learnt from my previous mistakes, stayed calm, sat up, took it easy and started pouring shakes, Powerade and gels down my neck. 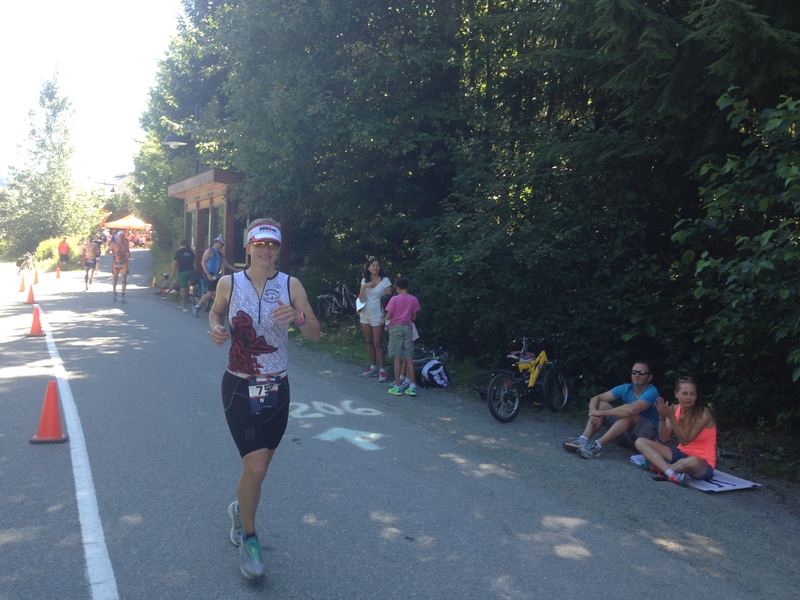 Thankfully by the time I got back to Pemberton and started the long ride back to Whistler my energy levels had been restored so by T2 I’d made up all the time I’d lost during the swim. I was aiming for 6 hours so was stoked to do a 5:42 and get my run started pretty much exactly at 2pm. Run: I’d expected the run to be hard but hard doesn’t even come close to describing it, in fact I think the first word I used to describe it to my wife after finishing was disgusting. As soon as I came out of transition I knew my estimated time of 4 hours was not going to happen and this was confirmed when I hit my first hill and my run quickly changed to a walk. Forget physical fitness, this marathon had suddenly turned into the biggest mental challenge of my life and the best way for me to deal with it was 2km at a time as I made my way from one aid station to the next. I was so grateful to my awesome colleagues and amazing wife who had all got up at silly o’clock to cheer me on at the start and follow me all day long, seeing their faces and hearing their encouragement as well as all the support from the hoards of fantastic spectators really helped me keep my legs moving. I spent pretty much all of the run recalculating and estimating my finishing time as I’d set a goal of 11 hours for a happy day and 12 hours as a redo. Thankfully I’d managed to save a little for the last 5km and got close enough to my target with a time of 11:18:56 that I was well and truly satisfied and immediately said to my wife after finishing that I would never do another full Ironman ever again! Don’t get my wrong, the sense of accomplishment is truly fantastic and the number of people who have said to me that I’ve inspired them is amazing but this doesn’t change the fact that this race was at times very unpleasant and really not very enjoyable. I love triathlons and will continue to race in the future but the distance on this course is something that will be a challenge to many athletes in the future but never again to me. Editor’s note: The number of times Gary says “never again” makes me think the athlete doth protest too much. NJ: Race day I think I was much calmer than last year. I knew what I was in for and had accepted it was going to be longer. I wasn’t going to beat my time and I was okay with that. Had a good swim, despite having to move around quite a bit to find some open water and get out of the washing machine of arms, legs and rough water. Bike is such a lovely course, I was looking forward to a nice ride and it was such a great temperature to start with. Right off the bat my tummy wasn’t happy (too much lake water sloshing about) and quickly had to switch to nutrition plan b (nothing solid). It went fairly well till I couldn’t tolerate gel anymore. 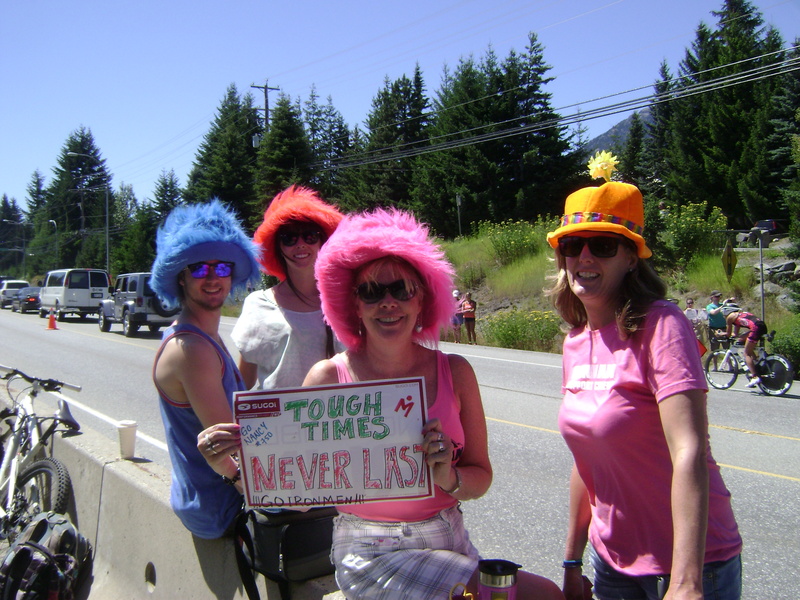 So much fun riding into Whistler and Pemberton and having friends cheer, hand me my stuff in special needs, drinks at the aid stations. What great community support for this event. Kept smiling the whole ride. By the time I started the run I was pretty light headed and nauseous. Kept making myself drink water and electrolytes but then would have to walk a few minutes so I wouldn’t throw it right back up. I am going to have to find those non drowsy gravol cause we both know I can’t handle the full strength kind. Did meet a few lovely folks on the run so nice to be able to chat after the solo efforts in the swim and bike. Ok, so every non-local was talking about the BEARS-OH-MY-GOD-THE-BEARS. So, did you see any on race day? GM: I saw the back end of one is it disappeared off into the bushes. NJ: I did not see any bears….on race day. Besides the obvious – the hills – what words of wisdom would you share with someone who is thinking of coming to race IMC? GM: Expect anything up here as the weather can change in an instant in the mountains. Heat, wind, rain, even snow as we had a fresh dusting on the mountain tops just a week before race day. NJ: Come train here, knowing what is around the corner is such a huge bonus whether its a hill, valley, aid station or just shade. GM: Finishing! 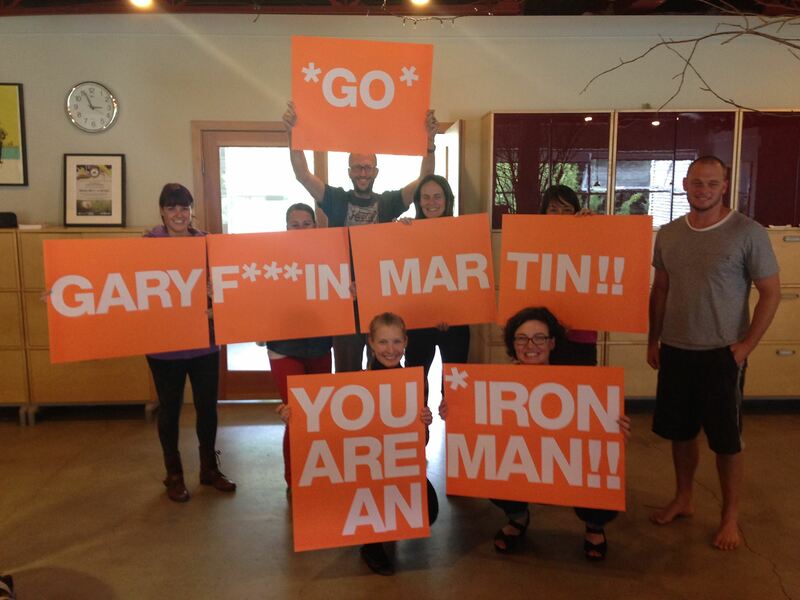 Okay so maybe not just finishing but finishing in a time that means I will never have to do another Ironman. NJ: Having family and friends supporting and encouraging along the way. GM: Every step of the marathon, just brutal. NJ: Wanting to quit on the first lap of the run I was so unhappy. Did you achieve your goals and what you’d set out to do? NJ: I hadn’t committed to a race time but wanted to enjoy my day. And while I did have a few low moments I did enjoy parts of my day, met some wonderful people, took all the high 5s, hugs and encouragement and thanked volunteers. What was the best part about crossing that finish line? GM: As stated a couple of times before the fact I will never, ever, have to do another one! NJ: Actually finishing and it was still light. Having someone with more sense than me to know I needed to go to the medical tent. Thanks for that and for keeping my family posted on my status. ZZZ. Editor’s note: I was that “someone”. Nancy crossed and said she was feeling nauseous. I said “Go to Medical”. She responded something like “No, no. They must be busy, I’m not that bad”. Which basically made me force her to go. Went I went back to check on her a little later, she looked so cute napping with her feet up on a box of water under her space blanket. GM: A week after the race I was back in training as I have a marathon on September 6th. Really looking forward to this one with the knowledge that I don’t have to swim 4km and bike 180km before I start. This’ll be my last race of the year as its time to wrap things up and focus on the snow which fingers crossed, will soon be with us. 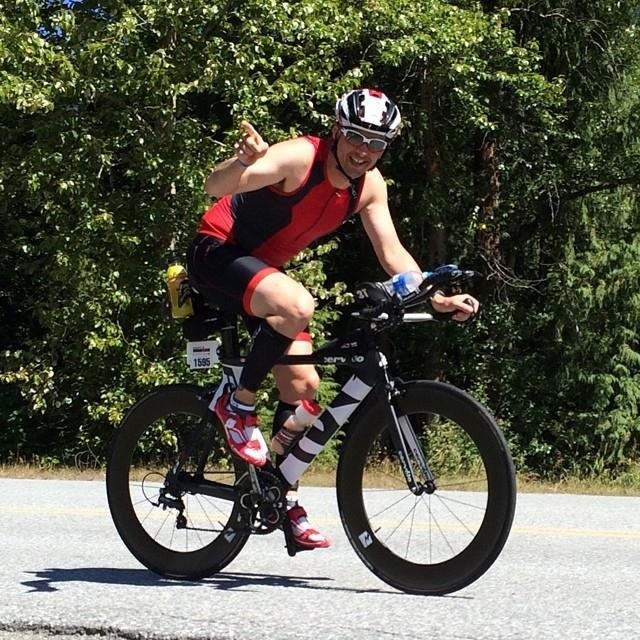 I will most certainly continue to race triathlons in the future but my focus will now move from the longer endurance races to the shorter sprint and Olympic distances. NJ: Up next was Challenge Penticton half. Another lovely day, fun event with good friends. Thanks to Nancy and Gary for taking the time to answer my pesky questions. Stay tuned for Danny’s update (when he can tear himself away from the fruity drinks).